Sita and I will be at another book signing on Sunday April 28th from 2; 00 – 4:00 at Pet Valu at Washington Square. I will have all three of my books there and if you want some books signed you already purchased you can bring them in! Fair warning – this is a puppy rescue day so if you are tempted to bring home one more puppy – that can be addictive! We are excited to see you and hope you can come. A pet store, plus little puppies, plus books and Sita – what more can we ask for! MARY ANN DONUTS BOOK SIGNING!!! HAVE A DONUT AND BUY THE BOOKS!!! I will have all three of my books available to autograph. Please come to this fun event! You will have a chance to meet a diversity of authors and topics! Jane and Sita will be available at the North Canton YMCA on Thursday October 18, 2018 to speak on Jane’s cancer journey. 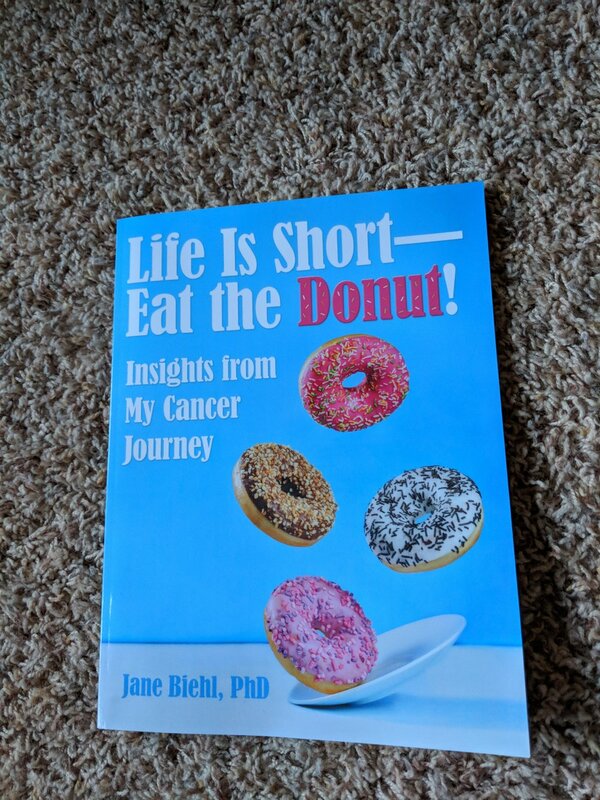 Her book on this journey Life is short - eat the donut: Insights from my cancer journey will be on sale. I hope to see all of you there!